A few months ago, my husband and I moved to Dorchester, Massachusetts, to work as caretakers of the William Clapp house, which was built in 1806. William Clapp and his wife, Elizabeth (Humphreys) Clapp, were married in the parlor of this house on 15 December 1806. They had nine children, two of whom died at a young age. This family also suffered the loss of three more children in November of 1838 from typhoid fever. Rebecca Clapp, aged twenty, and James Clapp, aged nineteen, died on the same day, and their brother Alexander Clapp, aged seventeen, died four days later. William Clapp and his sons, Lemuel, Thaddeus, and Frederick, were involved in a number of agricultural pursuits, including the hybridization of pears, most notably the “Clapp’s Favorite” pear. To accommodate their large family, and address the need for added work space for dairy production and other farming tasks, an addition was built onto the back of this house circa 1838. My husband and I live in this section of the house. It is believed that the large fireplace in our living room was used for cooking in order to use the original kitchen in the basement of the main house for other farm duties. Our basement was used for the production of butter and cheese, and it is possible that over the years a few farmhands or servants resided as boarders in the addition. Four generations of the Clapp family lived in this house. Frank L. Clapp, William and Elizabeth (Humphreys) Clapp’s great-grandson, was the last member of this family to reside on the property. Frank married but did not have any children. He sold the house to the Dorchester Historical Society in the mid-1940s, but continued to live in the house until his death in 1953. Today this house serves as the headquarters of the Dorchester Historical Society. My husband and I conduct tours of the property for visitors once a month, which has provided us with the opportunity to learn more about the Clapp family and the history of Dorchester. There is a strong possibility that the initials pertain to these two girls, since Lemuel and Charlotte (Tuttle) Clapp lived in this house with Lemuel’s parents, William and Elizabeth (Humphreys) Clapp, after their marriage in 1840. Lemuel and Charlotte’s oldest child, Rebecca Dexter Clapp, was born in Dorchester on 9 May 1841. [ii] Her sister Sarah Austin Clapp was born in Dorchester on 18 February 1848. [iii] Rebecca and Sarah had three other siblings: William (Frank L. Clapp’s father), Elizabeth, and James. 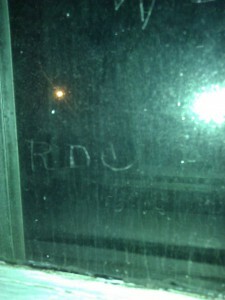 There are two other initials etched in the window that appear to match up with the first names of two of the siblings, “W” and “E.” A third letter is more difficult to read. While it looks like a “T,” it may have been a “J,” which would match the first name of the youngest sibling, James Clapp. Rebecca Dexter Clapp in 1858. 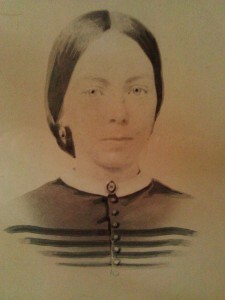 Rebecca Dexter Clapp died in Dorchester on 6 March 1865 from consumption. [iv] She was twenty-three years of age. A photograph of Rebecca hangs in the front room of the William Clapp house. It was taken circa 1858 when she was about seventeen. 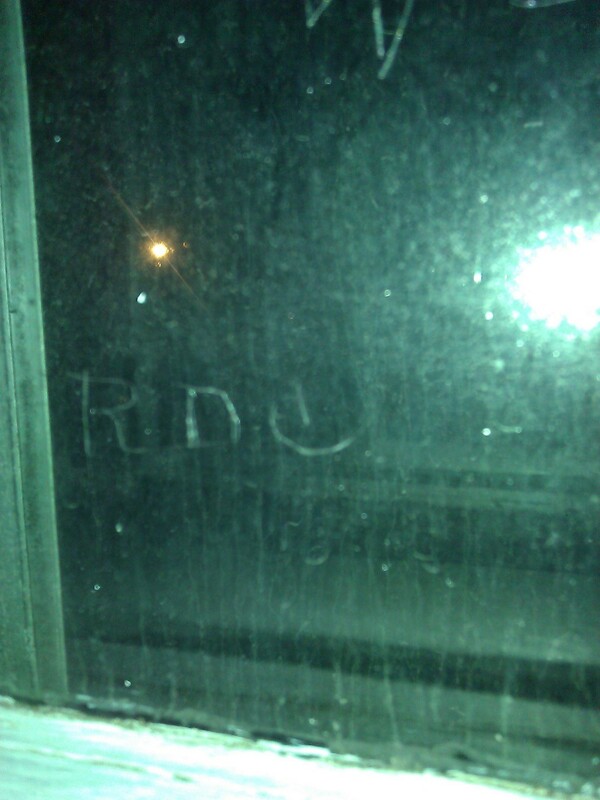 There is no way of knowing when the initials were written on our window, but when I look at them, I cannot help but imagine several of the Clapp children running up the stairs and playing in that very room. No one from the Clapp family has lived in this house in over sixty years, but those initials are a lasting reminder of members of that family from long ago. [i] 1860 U.S. Census, Dorchester, Norfolk County, Massachusetts, Roll: M653_516; Page: 290; Image: 292, viewed at Ancestry.com. [ii] Massachusetts Vital Records to 1850, online database at AmericanAncestors.org, citing Vital Records of the Town of Dorchester from 1826 to 1849, 2: 17. [iv] Massachusetts Vital Records, 1841-1910, online database at AmericanAncestors.org, citing Dorchester deaths, 184: 202. Likely a relative of Capt. Roger Clapp, also of Dorchester. http://winthropsociety.com/doc_clapp.php. Yes, you are correct Michael. William Clapp has family ties to Roger, as well as Roger’s cousin Nicholas. My wife and I visited Shirley Plantation in Williamsburg, VA several weeks ago. The Hill Carter family built the house in 1723, and still lives there. One of their family traditions was to have the daughters to scratch their initials in the window glass when they became engaged, (possibly to be sure the diamond was real!). This has been done right up to the current generation. However, as at least one of the Clapp daughters never married, this doesn’t seem to be the case here. In my own family “homestead” an earlier owner Jennie Thomas scratched her whole name on the glass in the 1860-70 time frame. She also never married. When my husband noticed the initials on the windows, he said it reminded him of the etchings on the windows of The Old Manse in Concord, MA. I received an email a few years back from the current owner of an ancestral home, who had found initials carved in a wall. I think I know to whom they belonged, William Ellis Willson of Framlingham, Suffolk UK who was born in 1841 and was last heard of in Australia. I have also found names and dates in my 1928 house when stripping wallpaper, so now I always sign everything I work on, just for fun. I am related to William Warland Clapp, Sr. and Jr. of Boston newspapers fame and wonder if he is any relation to your WIlliam. 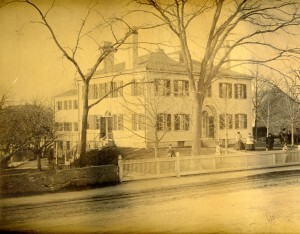 This house is identified in the text as built 1806 and in the photo caption as ca. 1870. Do you have a more precise dating? And to think that my brother and I, after carving our initials in the windowsill of our 1929 house when we were kids in the 1950s, were punished! We were just leaving mysteries for future generations of historians and genealogists to solve. Our punishment was to carefully sand down the offending initials and then varnish the windowsill so that what we’d done was more or less invisible. I guess we did learn something about sanding and varnishing out of it. Oh, and carving, too! Thank you Michael and Friends for all the great info you have given me to assist me in my research. There are Hilton and Morris links distantly here. At least it will start me off in my research. There are probably more links to my family tree as well. It will take me sometime to peruse the files here. I love doing historical research. I will be keeping in touch with you. There most likely will be other many and varied connections. I will send more data as I get some time to work on research. Sincere Best Wishes, Paul Morris Hilton, Harvey Station, New Brunswick, Canada.